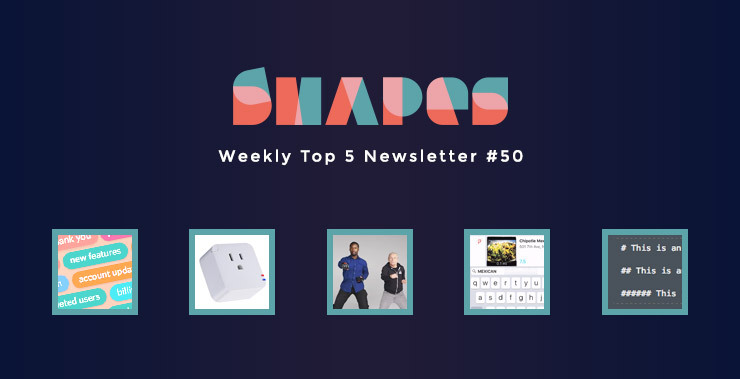 Weekly Top 5 #50 – Writing Well, Fixing Routers and What Does Old Look Like? Want to do something well and don’t know where to start, copy the masters. This is a wonderful and comprehensive collection of effective email copies from some of the best marketing companies. If you haven’t heard of Markdown, then maybe it’s time to pay attention, it’s very easy to learn, and makes your text formatting so much faster. It turns plain text to super beautiful formatted HTML. I’m actually writing this article on Dillinger online markdown editor right now. Ever had that annoying problem with your home wifi router dying on you and the only way it would work again is if you switch the power off then back on again? Well this little device can actually do that for you, perfect for the lazy and those who needs access to your home computer when you are away. #FirstWorldProblem. This could be specially useful with you have smart appliances. One Video: What does old look like? A nicely made video that asked millennials to answer what age is ‘old’ and what does ‘old look like’ I was very glad to see some of them were proven to be very wrong. It’s only 4 minutes long, give it a watch. I’ve had a pretty good week, an excellent weekend with friends and a productive week at work. I realise I’m much happier with my work when I have well defined objective to work toward. I focus better and are generally more productive. [The Good] I’ve been writing in my 5 mins journal every day and night for over a week. I like how it forces you to think what actually went well.